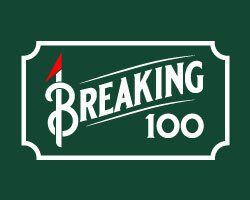 A Great Blend of Playability and Challenge. 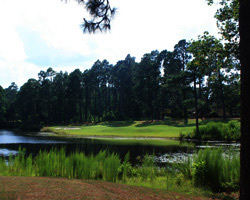 Longleaf is a favorite of locals and visitors to the Sandhills area. 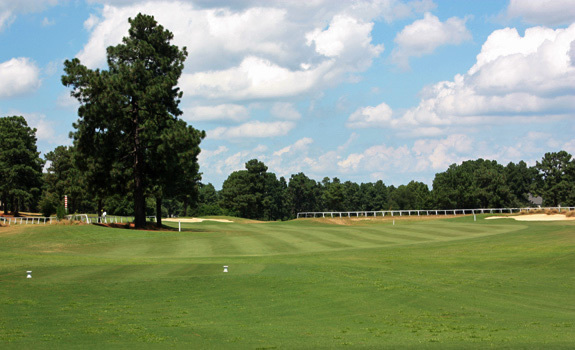 Dan Maples has created a wonderfully playable routing at Longleaf using the grounds of an old equestrian center and its racetrack as the backdrop to the opening nine. With big wide fairways and forgiving rough, the front side gives you lots of room to get to the greens. The back nine plays through tighter corridors with lots of elevation change and water to add a different dimension to the finishing side of your round. 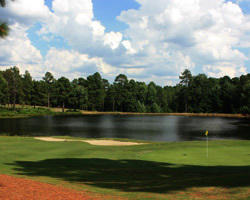 A fun round with great value awaits you at Longleaf. Par 71, 5208 - 6600 yards, 66.3 - 71.1 rating, 109 - 127 slope. 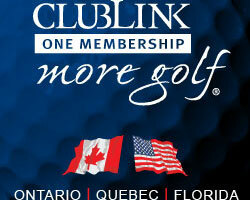 Public access and with various Sandhills golf packages. The 4th is a dogleg left Par 4 playing through a gap in the old race track. Maples has leveled a section of the track and left the the rails in place to frame the landing area. A clump of trees and the quarter pole mark the inside of the dogleg. Hole 14 is a fun, exacting, horseshoe-shaped Par 5. A dogleg left twice, this hole is all about giving yourself your ”next” shot. The safe route is to play to the middle of the fairway and not try to cut off too much for fear of getting blocked out for your next shot. The 15th is a beautiful Par 3 set across a pond. The lengthy hole has a bailout right, but the play is to the center of the green for a chance at par or even a well deserved birdie.